For the former ballpark in Los Angeles, see Wrigley Field (Los Angeles). Wrigley Field /ˈrɪɡli/ is a baseball park located on the North Side of Chicago, Illinois. It is the home of the Chicago Cubs, one of the city's two Major League Baseball (MLB) franchises. It first opened in 1914 as Weeghman Park for Charles Weeghman's Chicago Whales of the Federal League, which folded after the 1915 baseball season. The Cubs played their first home game at the park on April 20, 1916, defeating the Cincinnati Reds with a score of 7–6 in 11 innings. Chewing gum magnate William Wrigley Jr. of the Wrigley Company acquired complete control of the Cubs in 1921. It was named Cubs Park from 1920 to 1926, before being renamed Wrigley Field in 1927. In the North Side community area of Lakeview in the Wrigleyville neighborhood, Wrigley Field is on an irregular block bounded by Clark (west) and Addison (south) streets and Waveland (north) and Sheffield (east) avenues. Wrigley Field is nicknamed "The Friendly Confines", a phrase popularized by "Mr. Cub", Hall of Fame shortstop and first baseman Ernie Banks. The oldest park in the National League, the current seating capacity is 42,495; it is the second-oldest in the majors after Fenway Park (1912), and the only remaining Federal League park. Wrigley Field is known for its ivy-covered brick outfield wall, the unusual wind patterns off Lake Michigan, the iconic red marquee over the main entrance, the hand-turned scoreboard, its location in a primarily residential neighborhood with no parking lots and views from the rooftops behind the outfield, and for being the last Major League park to have lights installed for play after dark, in 1988. 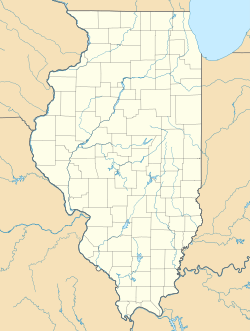 Between 1921 and 1970, it was the home of the Chicago Bears of the National Football League, and was also the home of the Chicago Cardinals (now Arizona Cardinals) of the National Football League between 1931-1938. The elevation of its playing field is 600 feet (180 m) above sea level. Baseball executive Charles Weeghman hired his architect Zachary Taylor Davis to design the park, which was ready for baseball by the date of the home opener on April 23, 1914. The original tenants, the Chicago Whales (also called the Chi-Feds) came in second in the Federal League rankings in 1914 and won the league championship in 1915. In late 1915, Weeghman's Federal League folded. The resourceful Weeghman formed a syndicate including the chewing gum manufacturer William Wrigley Jr. to buy the Chicago Cubs from Charles P. Taft for about $500,000. Weeghman immediately moved the Cubs from the dilapidated West Side Grounds to his two-year-old park. In 1918, Wrigley acquired the controlling interest in the club. In November 1926, he renamed the park "Wrigley Field". In 1927, an upper deck was added, and in 1937, Bill Veeck, the son of the club president, planted ivy vines against the outfield walls. The Ricketts family aggressively pursued a Wrigley Field renovation since buying the team and the stadium in 2009. During the annual Cubs Convention in January 2013 the family revealed the 1060 Project which called for a $575-million, privately funded rehabilitation of the stadium that was to be completed over the course of five years. The proposal was vast, and included planned improvements to, among other things, the stadium's facade, infrastructure, restrooms, concourses, suites, press box, moving the bullpens and clubhouses, as well as the addition of restaurants, patio areas, batting tunnels, a 5,700-square-foot jumbotron, and an adjacent hotel, plaza, and office-retail complex. After months of negotiations between the team, local Alderman Tom Tunney, and Chicago Mayor Rahm Emanuel, the plan obtained the endorsements of both the city's Landmarks Commission and Plan Commission before receiving final approval by the Chicago City Council in July 2013. To help fund the project, the team planned to more than double the amount of advertising signage in and around the stadium to about 51,000 square feet, including additional signage to be placed beyond the outfield walls – a move that was opposed by many owners of the rooftop clubs that surround the stadium who worried that such signage would obstruct their sightlines. Before work on the project began, the team wanted the rooftop owners to agree not to pursue legal action challenging the construction and continued to negotiate privately with them – offering to reduce the size and number of signs to be built – in order to gain their assent. The team could not come to terms with the rooftop owners who had a lease agreement with the team until 2023 in exchange for paying 17% of the gross revenues. In May 2014 the Cubs announced they would pursue the original 2013 plan to modify the park. Over the course of the next three years, the Ricketts family began to purchase many of the rooftop locations. The "1060 Project – Phase One" started Monday, September 29, 2014. During the off-season, the bleachers in both outfields were expanded and the stadium's footprint was extended further onto both Waveland and Sheffield Avenues. A 3,990 sq ft (370 m2) Jumbotron scoreboard was added to the left field bleachers. It is topped with a sign advertising Wintrust Financial, a Rosemont-based bank and a Cubs Legacy Partner; the "W" in Wintrust flashes after every Cubs win. A 2,400 sq ft (220 m2) video scoreboard was also added in the right field bleachers, and the parking lots along Clark Street were excavated for future underground players' locker rooms and lounges. After the close of the extended 2015 season, work began on "Phase Two" of the project. The area just west of the stadium was converted into an underground 30,000-square-foot (2,800 m2) players locker room and strength/conditioning/training and hydrotherapy sections, players lounges, a media center, and team offices. The previous clubhouse space was utilized to enlarge the dugout and add two underground batting cages, an auditorium, and more team office space. A new "Third Base Club" next to the batting tunnels and a "Home Plate Club" was introduced behind home plate and a new 30,000 square foot concessions preparation and staging area was constructed below the new Triangle Plaza. All seats, from the left field foul pole to the main gate, were replaced. An upper-deck exposed concourse was added along the south and west roof-line of right field. Bathroom facilities and concessions were improved throughout the park. Exterior renovations of the park seek to restore design elements present before the 1960s. These details include ornamental muted-green grill-work and red terra cotta roofing. Phase Three of the 1060 Project was completed before the start of the 2017 season. The left and right field bullpens were relocated to enclosed areas under the bleachers, the brick walls were extended toward the field and new seating was added in the vacated bullpen areas. A visiting team "batting tunnel" was added. Partial facade replacement and concourse restoration was completed along Addison Avenue along with structural improvements to the right field bleachers. The outfield turf was replaced just weeks before the start of the season. The Cubs Plaza building just to the west of Wrigley was finalized and the Park at Wrigley, the area above Cubs players dressing rooms, was in use for fans before and during games. Construction of Hotel Zachary along the west side of Clark street was ongoing. The fourth phase of improvements began at the conclusion of the 2017 season. The dugouts have been moved further down the left and right field foul lines to make room for two of the four new luxury clubs. The seating area behind home plate was reconstructed to locate another of the new clubs. The final upper level club is planned for the 2019 season. The Hotel Zachary, just across Clark street, was open for business in time for the Cubs first home game on April 9, 2018. On May 26, 2015, Cubs rookie third baseman Kris Bryant was the first to hit the new left field videoscreen with his 477-foot (145 m) home run. On October 13, the Cubs clinched a playoff series at home in Wrigley Field for the first time in franchise history with a 6–4 victory in game four of the 2015 NLDS. After Anthony Rizzo hit what would be the game-winning and series winning home run in the 6th inning, Kyle Schwarber's 7th inning insurance home run ball landed on top of the right field scoreboard. The ball was left in place, encased in clear Plexiglas to protect it from the elements. During the 2014 season, the Cubs celebrated the centennial of Wrigley Field throughout the season. Each decade was represented during ten homestands throughout the season. The April 23rd game, the 100th Anniversary, featured the Cubs playing the Arizona Diamondbacks in a throw back game. Each team represented one of the teams which played in the inaugural game at the stadium. The Cubs wore the uniforms of the Chicago Whales (Federals), the original occupants of the stadium and Diamondbacks wore uniforms representing the Kansas City Packers, whom the Federals played on April 23, 1914. Wrigley Field follows the jewel box design of ballparks that was popular in the early part of the 20th century. The two recessed wall areas, or "wells", located both in left and right field, give those areas a little more length than if the wall were to follow the contour from center field. It is also in those wells, when cross winds are blowing, that balls have a habit of bouncing in all directions. In addition, there is a long chain-link fence strip running the entire length of the outfield wall, the base of which is about two feet down from the top of the wall and the top of which projects out at an angle, primarily used to keep fans from falling out of the bleacher area and onto the field of play, which is about seven to ten feet below the top of the wall. Called "The basket", by players and fans alike, the rules of the field state that any ball landing within the basket is ruled a home run, making the distance to hit a home run in Wrigley Field actually shorter than the location of the outfield wall. The ballpark is famous for its outfield walls which are covered by ivy. In the first weeks of the baseball season, the ivy has not leafed out, and all that is visible are the vines on which it grows. However, as the baseball season progresses further into spring, the ivy grows thick and green, disguising the hard brick surface of the outfield wall. In the autumn, generally during post-season, the ivy turns red. 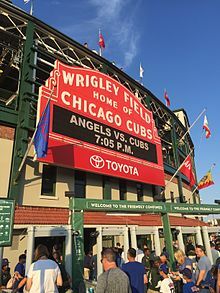 On April 7, 2013, Total Pro Sports voted Wrigley Field the "Best Place to Catch a Game in 2013," owing the award primarily to its architecture and ivy-coated fields. In 1937, the stadium was renovated and P. K. Wrigley discussed beautification with then Chicago Cubs President William Veeck Sr. Veeck suggested planting ivy on the outfield walls. The ivy was originally English ivy but was later changed to Parthenocissus tricuspidata—what's commonly called, Boston Ivy and Japanese Bittersweet, which can endure the harsh Chicago winters better than its English cousin. Cuttings from the ivy were sold by local vendors. The Chicago Cubs attempted to grow the ivy on the outside of Wrigley Field as well, but the plantings were often stolen so the Cubs abandoned the plans. 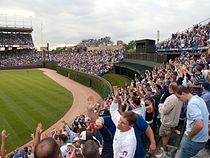 Under the ground rules of Wrigley Field, if a baseball gets into the ivy and gets stuck, the fielder is entitled to raise his arms to signify that the ball is unplayable (even if he can see it in the vines), and the batter is awarded a ground rule double by the umpires; runners can move up only on force plays. However, if the ball becomes dislodged or the fielder reaches into the vines to try and get the ball, it is considered in play and the runners can advance. Although the ivy appears to "pad" the bricks, it is of little practical use in this regard. There have been occasions of fielders being injured when slamming into the wall while pursuing a fly ball. The distances from home plate to various points in the outfield have remained essentially unchanged since the bleachers were remodeled during the 1937 season. They were originally marked by wooden numbers cut from plywood, painted white, and placed in gaps where the ivy was not allowed to grow. Since the early 1980s, the numbers have been painted directly on the bricks, in yellow. Although the power-alley dimensions are relatively cozy, the foul lines are currently the deepest in the major leagues. It is 355 feet (108.2 m) to the notch in the wall just beyond the left field foul pole. The point where the bleacher wall begins to curve inward in left-center field, one of the two "wells", is an unmarked 357 feet (108.8 m). The front part of the left-center "well" is the closest point in the outfield, about 360 feet. The marked left-center field distance is 368 feet (112.2 m). It is closer to true center field than its right-center counterpart is. True center field is unmarked and is about 390 feet (118.9 m). The center field marker, which is to the right of true center field and in the middle of the quarter-circle defining the center field area, is 400 feet (121.9 m) and is the deepest point in the outfield. 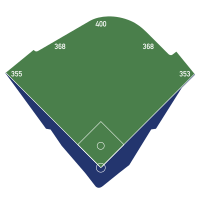 Right-center field is 368 feet (112.2 m), the notch of the right-center "well" is an unmarked 363 feet (110.6 m), and the right field foul line is 353 feet (107.6 m). The backstop is listed in media sources as 60.5 feet (18.4 m) behind home plate. Although that distance is standard, the relatively small foul ground area in general gives an advantage to batters. When the Wrigley Field was constructed in 1914, the buildings along Waveland and Sheffield avenues gave spectators a view of what was going on inside the ballpark. The rooftops were not seen as "big business." They would later become a popular spectator area during the 1929 World Series. The 1938 World Series brought "paying" spectators to the rooftops. Fans sat in lawn chairs and brought their own food and beverages. It was not until the mid 1980s owners began updating the rooftops to have bleacher-style grandstands. The rooftops were also turned into a legitimate business. More businesses began purchasing rooftops around Wrigley Field seeing them as profitable resource. The Sky Box on Sheffield open in 1993. Back then, it catered to corporate groups. Today, it is complete with a two-tier roof deck, indoor clubhouse, fully staffed bars on three levels, and an elevator. In 1998, the city required rooftop owners to have a license and began to regulate the venues. 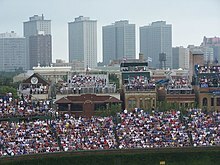 In 2003, relations between rooftop owners and the Cubs worsened when the team put up a large screen to block the view of the rooftops. The screens exemplified what is known as a spite fence. The Cubs then sued most rooftop businesses that year. The Cubs felt that the rooftops were stealing from the team's product and the rooftop owners were "unjustly enriching themselves." In 2004, the building owners agreed to share a portion of their proceeds with the Cubs. Rooftop owners were required to pay the Cubs 17% of their gross revenue. The agreement lasts until 2023. 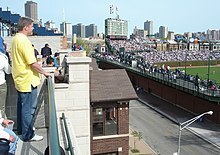 The Cubs obtained permission from the city to expand the ballpark's own bleachers out over the sidewalks and do some additional construction on the open area of the property to the west, bordered by Clark and Waveland, and to close the remnant of Seminary Avenue that also existed on the property. The rooftop seats are now effectively part of the ballpark's seating area, although they are not included in the seating capacity figure. In July 2016, R. Marc Hamid, a former rooftop owner was convicted on nine counts of mail fraud and illegal bank structuring. Hamid had been under reporting attendance at the Sky Box on Sheffield from 2008 to 2011. Over those years, Hamid covered up more than $1 million in revenue while also avoiding hundreds of thousands of dollars in taxes and royalties that violated the agreement rooftop owners had with the Cubs. In January 2017, Hamid was sentenced to 18 months in federal prison. The owners threatened suit in 2013 when the team announced plans to renovate the ball field and potentially disrupt the sight lines. When the rooftop owners did not agree to a scaled down plan for renovations of Wrigley, the Cubs owners announced, in May 2014, their intentions to implement the original 2013 plan for renovations even if it meant battling the issue in court. Cubs owner Ricketts said Wrigley has "the worst player facilities in Major League Baseball...I am saying it is the time to invest in Wrigley Field and do the things that our competitors do." By the end of the 2016 season, the Ricketts family had acquired 10 of the rooftop locations and have a financial stake in an 11th. Some of the rooftops became legendary in their own right. The Lakeview Baseball Club, which sits across Sheffield Avenue (right-field) from the stadium displayed a sign that read, "Eamus Catuli!" (roughly Latin for "Let's Go Cubs! "—catuli translating to "whelps", the nearest Latin equivalent), flanked by a counter indicating the Cubs' long legacy of futility. The counter was labeled "AC", for "Anno Catulorum", or "In the Year of the Cubs". Prior to the team's 2016 championship, it read AC0871108, with the first two digits indicating the number of years since the Cubs' last division championship as of the end of the previous season (2008), the next two digits indicating the number of years since the Cubs won the National League Pennant (1945), and the last three digits indicating the number of years since their last World Series win (1908). After winning the World Series in 2016, the sign was updated to AC0000000. In April and May the wind often comes off Lake Michigan (less than a mile to the east), which means a northeast wind "blowing in" to knock down potential home runs and turn them into outs. In the summer, however, or on any warm and breezy day, the wind often comes from the south and the southwest, which means the wind is "blowing out" and has the potential to turn normally harmless fly balls into home runs. A third variety is the cross-wind, which typically runs from the left field corner to the right field corner and causes all sorts of havoc. Depending on the direction of the wind, Wrigley can either be one of the friendliest parks in the major leagues for pitchers or among the worst. This makes Wrigley one of the most unpredictable parks in the Major Leagues. Many Cubs fans check their nearest flag before heading to the park on game days for an indication of what the game might be like; this is less of a factor for night games, however, because the wind does not blow as hard after the sun goes down. With the wind blowing in, pitchers can dominate and no-hitters have resulted. The last two by a Cubs pitcher occurred near the beginning and the end of the 1972 season, by Burt Hooton and Milt Pappas respectively; not until Cole Hamels of the Philadelphia Phillies no-hit the Cubs in 2015 would another no-hitter be pitched at Wrigley. In the seventh inning of Ken Holtzman's first no-hitter, on August 19, 1969, Hank Aaron of the Atlanta Braves hit a ball that looked headed for the bleachers, but the wind caught it just enough for left fielder Billy Williams to leap up and snare it. With the wind blowing out, some true tape-measure home runs have been hit by well-muscled batters. Sammy Sosa and Dave "Kong" Kingman broke windows in the apartment buildings across Waveland Avenue several times. Glenallen Hill put one on a rooftop. Batters have occasionally slugged it into, or to the side of, the first row or two of the "upper deck" of the center field bleachers. Sosa hit the roof of the center field camera booth on the fly during the NLCS against the Florida Marlins, some 450 feet away. But the longest blast was probably hit by Dave Kingman on a very windy day in 1976 while with the Mets. According to local legend, that day, Kingman launched a bomb that landed on the third porch roof on the east (center field) side of Kenmore Avenue, some 550 feet away. No batter has ever hit the center field scoreboard. However, it has been hit by a golf ball hit by Sam Snead using a two iron. No matter the weather, many fans congregate during batting practice and games on Waveland Avenue, behind left field, and Sheffield Avenue, behind right field, for a chance to catch a home run ball. The scoreboard at Wrigley Field is operated by hand. Along with Fenway Park's scoreboard and Oracle Park's out of town scoreboard, Wrigley is one of the last parks to maintain a hand-turned scoreboard. Unlike the home of the Red Sox, the scoreboard at Wrigley is mounted above the centerfield bleachers, rather than at ground level, making it harder to hit during play. No players have hit the current scoreboard, although several have come close. The scoreboard was installed in 1937, when Bill Veeck installed the new bleachers. The scoreboard has remained in place ever since, and it has only seen minor modifications. The clock was added in 1941, a fifth row of scores was added to each side in 1961; by 1969, a sixth. A set of light stands facing onto the scoreboard was added in 1988 with the introduction of night games. The centerfield bleacher scoreboard is still manually operated, with scores coming in through a computer (a ticker tape machine was used in the past); a number turner watches the score changes closely and updates scores by manually replacing the numbers from within the scoreboard. The scoreboard is made of sheet steel. The numbers that are placed into the inning windows are also steel, painted forest green, and numbered with white numerals. The box for the game playing at Wrigley uses yellow numerals for the current inning. The clock, which sits at the top center of the scoreboard, has never lost time in its 78-year existence. Standing over the clock are three flagpoles, one for each division in the National League. There are 15 flags, one for each National League team, and their order on the flagpoles reflects the current standings. The entrance to the scoreboard is a trap-door on the bottom. On the reverse of the scoreboard, visible from the CTA elevated trains, is a blue pennant, with the words "Chicago Cubs", in white outlined in red neon. The scoreboard was extensively rehabilitated for the 2010 season. 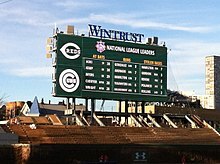 In 2010, the Cubs toyed with the idea of adding a video screen to the stadium, but the hand-turned scoreboard cannot be moved due to the park's landmark status. The landmark status also prohibits even simple facelifts such as adding two more games on either side (there are 15 teams in both the National and American leagues) of the 12-game, 24-team scoreboard (reflecting MLB from 1969 to 1976), so up to three games (1 NL, 1 AL, and the interleague) each day cannot be posted. Those games may eventually be part of the auxiliary video board currently on the right field that may also be added in left field. Most Cubs players support the concept of a video board, and work on two additional scoreboards began at the end of the 2014 season. It was announced March 21, 2013, that Alderman Tom Tunney wanted to demolish the scoreboard to clear the view for nearby residents, who watch games from their rooftops. "Demolishing the landmark old scoreboard has never been part of any plan discussed or envisioned by the Ricketts family," said Dennis Culloton, a spokesman for Tom Ricketts, the Cubs chairman. To date, there is a third generation scoreboard operator whose grandfather began working in the hand-turned scoreboard at its inception. The marquee was temporarily painted purple for the 2010 Land of Lincoln Trophy college football game. Directly over the main entrance to the stadium stands the most familiar icon of the exterior of the ballpark: a large red art deco-style marquee, with "Wrigley Field, Home of Chicago Cubs" painted in white. The marquee was installed around 1934. It was originally painted blue, and had changeable letters — similar to the scoreboard — to announce upcoming games. It read "Home of the Cubs", a legend that was replaced with "Home of Chicago Cubs" by 1939. (In years when the Bears played there, the sign was changed appropriately during football season.) On March 23, 1960, the Cubs repainted it red. Installed in 1934, the marquee was removed for restoration for the first time in 2015. In 1982, a two-line announcement board was replaced with an electronic LED message board and a backlit advertising panel was added below (this is now solid red). The marquee uses red neon lights at night, showing the familiar "Wrigley Field" in red, with the rest of the sign is in darkness. A Budweiser Beer slogan was on the lower panel in the early 1980s about the time when the team added the LED signage. Past and present owners of the park have used the marquee in some way as the park's trademark of sorts: the CTA Addison street platform that serves Wrigley Field uses an image of the marquee, painted on walls to announce the destination. The marquee was painted purple and featured an Allstate Insurance logo for the Northwestern Wildcats who played as the home team against the Illinois Fighting Illini in a Big Ten football game in November 2010. In 2015, a Toyota emblem was placed on the lower panel just below the LED sign on the marquee; previously, the area was used for logos of transient corporate sponsors and team initiatives. Toyota is one of the team's "Legacy Partners" and beginning with the 2016 season will display other signage in and around the park, including branding on all Wrigley Field parking lots. The marquee was temporarily removed and restored for the 2016 season, including new paint, a new LED display board, and new neon lights. The back of the sign was given a new green paint job as well, which can now be seen from the inside the terrace level. The Cubs were a hold-out against night games for decades, not installing lights at Wrigley until 1988 (after baseball officials announced that the park would be prohibited from hosting any future post-season games without lights). Before then, all games at Wrigley were played during the day. Night games are still limited in number by agreement with the city council. In 1942, then-owner Philip K. Wrigley had planned to install lights, but instead, the lights and stands were scrapped for the World War II effort. In the late 1980s, however, Cubs management insisted that the team was in danger of leaving Wrigley if lights weren't installed, and Major League Baseball threatened to make the Cubs play postseason "home" games at Busch Stadium in St. Louis. The 1984 World Series was scheduled to start in the National League park. But Major League Baseball actually had a contingency plan to instead start the World Series in the American League park in the event that the Chicago Cubs won the NLCS against the San Diego Padres. This would have allowed the Wrigley Field-hosted (i.e. daytime) games to be held over the weekend. In return, only one prime time game (Game 3 on Friday) would have been lost. Wrigley Field wouldn't have lights installed until four years later. To put things in proper perspective, had the Cubs advanced to the Series instead of the Padres, the Detroit Tigers would have hosted Games 1–2, and 6–7 (on Tuesday and Wednesday nights), while the Cubs would have hosted Games 3–5 (on Friday, Saturday and Sunday), with all three games in Chicago starting no later than 1:30 p.m. Central Time. Since the Padres wound up winning the 1984 NLCS, these plans proved moot. Additionally, had the Cubs won, it would have meant that the World Series would start in the AL city for three consecutive years (between 1983 in Baltimore and 1985 in Kansas City); this became a possibility when home-field advantage was awarded through the All-Star Game beginning in 2003. After 5,687 consecutive day games played by the Cubs at Wrigley, the lights were finally lit on August 8, 1988, for a game with the Philadelphia Phillies. That game was rained out after 3½ innings, and the first official night game took place the following evening against the New York Mets, a game which the Cubs won 6-4. The All-American Girls Professional Baseball League's first All-Star Game during the 1943 midseason, was played under temporary lights at Wrigley Field, between two teams composed of South Bend Blue Sox and Rockford Peaches players versus Kenosha Comets and Racine Belles players. It was also the first night game ever played in the historic ballpark (July 1, 1943). Weeghman Park's first tenant was the Federal League team, the Chicago Whales, from 1914 to 1915. Weeghman Park / Cubs Park / Wrigley Field has served as the home baseball park for Major League Baseball's Chicago Cubs franchise since 1916. The Chicago Bears of the National Football League played at Wrigley Field from 1921 to 1970 before relocating to Soldier Field. The team had transferred from Decatur, and retained the name "Staleys" for the 1921 season. They renamed themselves the "Bears" in order to identify with the baseball team, a common practice in the NFL in those days. Wrigley Field once held the record for the most NFL games played in a single stadium with 365 regular season NFL games, but this record was surpassed in September 2003 by Giants Stadium in New Jersey, thanks to its dual-occupancy by the New York Giants and New York Jets. The game played between the Jets and Miami Dolphins on September 14, 2003 was the 366th regular season NFL game at Giants Stadium breaking Wrigley's regular season record. The 50 seasons the Bears spent at Wrigley Field had been an NFL record until 2006 when Lambeau Field duplicated this feat by hosting the Green Bay Packers for the 50th season, and broke it in 2007. Initially the Bears worked with the stands that were there. Eventually they acquired a large, portable bleacher section that spanned the right and center field areas and covered most of the existing bleacher seating and part of the right field corner seating. This "East Stand" raised Wrigley's football capacity to about 47,000, or a net gain of perhaps 9,000 seats over normal capacity. After the Bears left, this structure would live on for several years as the "North Stand" at Soldier Field, until it was replaced by permanent seating. The football field ran north-to-south, i.e. from left field to the foul side of first base. The remodeling of the bleachers made for a very tight fit for the gridiron. In fact, the corner of the south end zone was literally in the visiting baseball team's dugout, which was filled with pads for safety, and required a special ground rule that sliced off that corner of the end zone. The end zone was also shorter than the north, as the south end zone was eight yards, compared to the regulation 10 yards. One corner of the north end line ran just inches short of the left field wall. There is a legend that Bronko Nagurski, the great Bears fullback, steamrolled through the line, head down, and ran all the way through that end zone, smacking his leather-helmeted head on the bricks. He went back to the bench and told Coach "Papa Bear" George Halas, "That last guy gave me quite a lick!" That kind of incident prompted the Bears to hang some padding in front of the wall. The Bears are second only to the Packers in total NFL championships, and all but one of those (their only Super Bowl championship) came during their tenure at Wrigley. After a half-century, they found themselves compelled to move, because the NFL wanted every one of its stadiums to seat at least 50,000 as a result of the AFL–NFL merger. The Bears had one experimental game at Dyche Stadium (now Ryan Field) on the Northwestern University campus in 1970, but otherwise continued at Wrigley until their transfer to the lakefront ended their five-decades run on the north side. One remnant of the Bears' time at Wrigley was uncovered during the off-season 2007–2008 rebuilding of the playing field: the foundations for the goal posts. Five NFL championship games were played at Wrigley Field; 1933, 1937, 1941, 1943 and 1963. Coupled with the Chicago Bears, the Chicago Cardinals of the National Football League called Wrigley Field home from 1931-1938. Born on the South Side of Chicago, the Cardinals also played their home games at Normal Park, Comiskey Park, and Soldier Field. 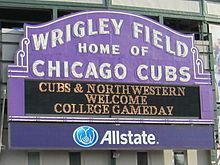 The Northwestern Wildcats and the Illinois Fighting Illini played a college football game at Wrigley Field on November 20, 2010. It was the first football game at Wrigley Field since 1970 and the first collegiate football game at Wrigley Field since 1938 when the DePaul Blue Demons played its regular games at Wrigley. The field used an east–west field configuration (third base to right field). In order to keep the playing field at regulation size, the safety clearances for each end zone to the walls in the field were considerably less than normal. In particular, the east (right field) end zone came under scrutiny as its end zone was wedged extremely close to the right field wall (as close as one foot in some areas), forcing the goal posts to be hung from the right field wall in order to fit. Despite extra padding provided in these locations, it was decided that all offensive plays for both teams play to the west end zone, where there was more safety clearance. The east end zone could still be used on defensive and special teams touchdowns, as well as defensive safeties; and, in fact, there was one interception run back for an eastbound touchdown. Big Ten Commissioner Jim Delany said that as late as three days before the game, he had only been apprised that the situation wasn't "anything other than tight." When he had a chance to fully vet the situation, however, he concluded that the space surrounding the east end zone was smaller than the minimum of six feet stipulated in NCAA rules, and it would have been too great of a risk to allow offensive plays to be run toward that end zone. The Fighting Illini won the game 48-27 taking home the Land of Lincoln Trophy, which was introduced in 2009. The Wildcats intend to return in 2020 against Wisconsin, but will return to the classic Bears configuration. A 2017-18 reconfiguration of the dugouts will allow the field to be played to a full south end zone. Wrigley Field configured for soccer in 2012. The Chicago Sting of the North American Soccer League (NASL) used Wrigley, along with Comiskey Park, for their home matches during the late 1970s and early 1980s. The Sting hosted the San Diego Sockers on August 25, 1979 at Wrigley when the Bears were using Soldier Field. Unlike the Bears' American football layout, the soccer pitch ran east-to-west, from right field to the foul territory on the third-base side. Soccer returned to Wrigley Field in July 2012, when Italian club A.S. Roma played Poland's Zaglebie Lubin in a friendly match. 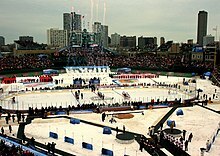 On January 1, 2009, the National Hockey League played its 2009 Winter Classic in The Friendly Confines pitting two "Original Six" teams – the host Chicago Blackhawks and the visiting Detroit Red Wings – in an outdoor ice hockey game. The rink ran across the field from first base to third base with second base being covered by roughly the center of the rink. The attendance for this game was 40,818. The Red Wings won 6–4. Since 2005, Wrigley Field has been opened on a limited basis to popular concerts, not without some controversy. Local neighborhood groups[who?] have expressed concerns about the impact of concert crowds and noise on the surrounding residential neighborhood, particularly in 2009 when three concerts were added to the schedule, one conflicting with an annual neighborhood festival. September 4, 2005 Jimmy Buffett — A Salty Piece of Land Tour 78,755 / 78,755 $7,897,550 These shows were his first ever at the ballpark and were captured on DVD with the release "Live in Wrigley Field." Darius Rucker American Living Unstoppable Tour 36,500 / 36,500 $2,512,250 The first country music group to play the ballpark. September 18, 2010 This show was recorded for the album "Live at Wrigley Field". July 31, 2011 Paul McCartney DJ Chris Holmes On the Run 83,988 / 83,988 $10,929,728 This was his first visit to Chicago since 2005. September 7, 2012 Bruce Springsteen & The E Street Band — Wrecking Ball World Tour 84,218 / 84,218 $7,090,141 Eddie Vedder was the special guest. July 19, 2013 Pearl Jam — Lightning Bolt Tour — — The show became the fastest concert to sell-out at Wrigley Field. The show was interrupted for more than two hours due to the threat of lightning. DeeJay Silver 2013 Night Train Tour 39,846 / 39,846 $3,111,156 Footage from this show was featured in a live concert DVD entitled 'Night Train to Georgia'. Kelly Clarkson was the special guest. Neal McCoy 2014 Ten Times Crazier Tour 40,912 / 40,912 $2,697,990 This was his first stadium show at the ballpark. Urge Overkill Sonic Highways World Tour 40,788 / 40,788 $2,501,510 Cheap Trick and Urge Overkill were special guests. June 24, 2016 Phish — 2016 Summer Tour 83,588 / 84,356 $4,761,063 These shows were webcast via Live Phish. During the second show, Happy Birthday was played for Phish tour manager Richard Glasgow. August 20, 2016 Pearl Jam — 2016 North America Tour 83,478 / 84,951 $5,712,625 At their second show, Dennis Rodman was the special guest. June 30, 2017 Dead & Company — Dead & Company Summer Tour 2017 79,489 / 86,856 $6,357,746 The July 1 show set the attendance record for the most tickets sold for a single concert at Wrigley Field, with 43,600 sold. August 25, 2017 Lady Gaga DJ White Shadow Joanne World Tour 41,847 / 41,847 $5,213,820 First female performer to headline at the ballpark. Wrigley Field shares its name with the Wrigley Company, as the park was named for its then-owner, William Wrigley Jr., the CEO of the Wrigley Company. As early as the 1920s, before the park became officially known as Wrigley Field, the scoreboard was topped by the elf-like "Doublemint Twins", posed as a pitcher and a batter. There were also ads painted on the bare right field wall early in the ballpark's history, prior to the 1923 remodeling which put bleachers there. After that, the Doublemint elves were the only visible in-park advertising. The elves were removed permanently in 1937 when the bleachers and scoreboard were rebuilt. It would be about 44 years before in-park advertising would reappear. Ironically given the roots of its name, Wrigley Field had been a notable exception to the trend of selling corporate naming rights to sporting venues. The Tribune Company, owners of the park from 1981 to 2009, chose not to rename the ballpark, utilizing other ways to bring corporate sponsorship into the ballpark. During the mid-1980s, Anheuser-Busch placed Budweiser and Bud Light advertisements beneath the center field scoreboard. Bud Light became the sponsor of the rebuilt bleachers in 2006. In the early 2000s, following the trend of many ballparks, a green-screen chroma key board was installed behind home plate, in the line of sight of the center field TV camera, to allow electronic "rotating" advertisements visible only to the TV audiences. By 2006, the board was set up to allow advertisements to be both physical and electronic (thus they can be seen in both live and replay shots). In 2007, the first on-field advertising appeared since the park's early days. Sporting goods firm Under Armour placed its logo on the double-doors between the ivy on the outfield wall, in left-center and right-center fields. Advertisements were also placed in the dugouts, originally for Sears department stores, then Walter E. Smithe furniture and now State Farm insurance. For 2008 and 2009, the Cubs worked out an agreement with the Chicago Board Options Exchange to allow the CBOE to auction some 70 box seat season tickets and award naming rights to them. For the 2009 season, the Cubs announced that the renovated restaurant space in the southeast corner of Wrigley Field, formerly known as the Friendly Confines Cafe, will be renamed the Captain Morgan Club. On October 27, 2009, Thomas S. Ricketts officially took over 95% ownership of the Chicago Cubs, Wrigley Field and 20% ownership of Comcast SportsNet Chicago. The Tribune will retain 5% ownership. Ricketts, however, has expressed no interest in selling the naming rights to Wrigley Field, preferring that it retain the name it has used since 1926. Corporate sponsorship has not been limited to the park itself. Wrigley Field is famous for its view of the neighborhood buildings across Waveland and Sheffield Avenues. In addition to spectators standing or sitting on the apartment roofs, corporate sponsors have frequently taken advantage of those locations as well. In the earliest days of Weeghman Park, one building across Sheffield Avenue advertised a local hangout known as Bismarck Gardens (later called the Marigold Gardens after World War I). That same building has since advertised for the Torco Oil Company, Southwest Airlines, the Miller Brewing Company, and Gilbert's Craft Sausages. A building across from deep right-center field was topped by a neon sign for Baby Ruth candy beginning in the mid-1930s and running for some 40 years. That placement by the Chicago-based Curtiss Candy Company, coincidentally positioned in the line of sight of "Babe Ruth's called shot", proved fortuitous when games began to be televised in the 1940s—the sign was also in the line of sight of the ground level camera behind and to the left of home plate. The aging sign was eventually removed in the early 1970s. Another long-standing venue for a sign is the sloping roof of a building behind left-center field. Unsuitable for the bleachers that now decorate many of those buildings, that building's angling roof has been painted in the form of a large billboard since at least the 1940s. In recent years it has borne a bright-red Budweiser sign and, beginning in 2009, an advertisement for Horseshoe Casino. Other buildings have carried signs sponsoring beers, such as Old Style (when it was a Cubs broadcasting sponsor) and Miller; and also WGN-TV, which has telecast Cubs games since April 1948. In January 2013 the Ricketts family launched "Legacy Partners," a marketing effort to sell new kinds of advertising in and around renovated Wrigley Field. In conjunction with the new W Partners, the Cubs entered into 10-year agreements with its largest advertisers. – Starwood Hotels, "Official Hotel of the Chicago Cubs" and a new hotel to be developed across the street from Wrigley Field. – Advocate Health Care, the largest health care provider in Illinois. – Toyota Motor Corporation A permanent position just below the Clark and Addison marquee and other signage in and around the park and Wrigley Field parking lots. Retired numbers for Ernie Banks and Ron Santo on the left field foulpole and for Billy Williams and Ryne Sandberg on the right field foulpole. Since May 3, 2009, the number 31 also flies on both foul poles, to honor Ferguson Jenkins (left field) and Greg Maddux (right field). Beginning in the days of P.K. Wrigley and the 1937 bleacher/scoreboard reconstruction, a flag with either a "W" or an "L" has flown from atop the scoreboard masthead, indicating the day's result. In case of a doubleheader that is split, both flags are flown. Past Cubs media guides show that the original flags were blue with a white "W" and white with a blue "L", the latter coincidentally suggesting "surrender". In 1978, blue and white lights were mounted atop the scoreboard, to further denote wins and losses. The flags were replaced in the early 1980s, and the color schemes were reversed with the "win flag" being white with a blue W, and the "loss flag" the opposite. In 1982, the retired number of Ernie Banks was flying on a foul pole, as white with blue numbers, in 1987, the retired number of Billy Williams joined Banks, the two flags were positioned from the foul poles, Banks from left field, and Williams from right field. Later on, the team retired numbers for Ron Santo, Ryne Sandberg, Ferguson Jenkins and Greg Maddux, with Jenkins and Maddux both using the same number (31). Keeping with tradition, fans are known to bring win flags to home and away games, and displaying them after a Cubs win. Flags are also sold at the ballpark. On April 24, 2008, the Cubs flew an extra white flag displaying "10,000" in blue, along with the win flag, as the 10,000th win in team history was achieved on the road the previous night. Alongside the tradition of the "W" and "L" flags, the song "Go Cubs Go" is sung after each home win. Also, following the 2015 addition of the park's Daktronics video screens, the large "W" in the "Wintrust" logo on the left field video screen is kept on following Cubs' wins. The tradition of singing "Take Me Out to the Ball Game" at Cubs home games began when Hall of Fame announcer Harry Caray arrived in 1982 (he had sung it the preceding seven years as a broadcaster for the White Sox), and it has remained a Wrigley Field staple. After Caray's death, the tradition of a guest conductor began, with former baseball players, other sports stars, actors, and other celebrities invited to sing during the Seventh Inning Stretch. Among the best-known guests have been former Bears coach Mike Ditka, former Cubs second baseman Ryne Sandberg, former pitcher Mike Krukow, former longtime Cubs first baseman Mark Grace, former Houston Rockets star Tracy McGrady, Chicago Blackhawks forwards Jonathan Toews and Patrick Kane, Chicago Bears quarterback Jay Cutler, comedian Jay Leno, NASCAR driver Jeff Gordon, singers Ozzy Osbourne and Eddie Vedder, boxer and actor Mr. T, actor and lifelong Cub fan Gary Sinise, actors, Tom Arnold, James Belushi, Bill Murray, WWE wrestler/Chicago native CM Punk, Vince Vaughn, and Illinois-native country music singer Brett Eldredge. During the 2016 postseason, someone wrote a message in chalk on the outer brick wall of the stadium along Waveland and Sheffield avenues. This started a chain reaction and more fans began to write their own messages on the wall. The messages were anything from words of support expressed towards the team or just a name. Chalk covered a majority of the wall, to point where fans had to bring step ladders in order to reach upper spaces for their message. The Cubs themselves encouraged the event by supplying chalk and adding extra security. The event gained both local and national attention, receiving coverage from Fox Sports and The Boston Globe. The north exterior of Wrigley Field, with manual scoreboard visible, as it appears during the offseason. This picture was taken prior to the outfield bleacher expansion, which brought the bleachers over the sidewalk. Fans on Waveland Avenue during a 2009 game. Padres starting pitcher Chris Young warms up in the bullpen. A few major league bullpens are in playable foul territory like those at Wrigley Field prior to the 2017 season. Wrigley Field had a brief cameo in the 1980 film The Blues Brothers, starring John Belushi and Dan Aykroyd as Jake and Elwood Blues. In the film, Elwood lists 1060 W. Addison as his fake home address on his Illinois driver's license, tricking the police and later the Illinois Nazis listening on police radio into heading for Wrigley Field. The 1984 film The Natural, starring Robert Redford, had a scene set at Wrigley but was actually filmed at All-High Stadium in Buffalo, New York. All other baseball action scenes in that movie were shot in Buffalo, at the since-demolished War Memorial Stadium. During Cubs games, fans will often stand outside the park on Waveland Avenue, waiting for home run balls hit over the wall and out of the park. However, as a tradition, Cubs fans inside and sometimes even outside the park will promptly throw any home run ball hit by an opposing player back onto the field of play, a ritual depicted in the 1977 stage play Bleacher Bums and in the 1993 film Rookie of the Year. The ballpark was featured in a scene in the 1986 film Ferris Bueller's Day Off, where the outside marquee read "Save Ferris". Many scenes from Rookie of the Year were filmed at Wrigley Field. The director, John Hughes, originally wanted to film at Comiskey Park (he was a White Sox fan) but the team was out of town during filming. Later, the 2006 film The Break-Up would use Wrigley Field as the setting for its opening scene. An early 1990s film about Babe Ruth had the obligatory scene in Wrigley Field about the "called shot" (the ballpark also doubled as Yankee Stadium for the film). A scoreboard similar to the one existing in 1932 was used, atop an ivy wall (though that did not exist until later in the decade). The ballpark was used for the establishing tryouts scene in A League of Their Own (1992). This film was a Hollywood account of the 1940s women's baseball league which Cubs owner P.K. Wrigley championed during World War II. Garry Marshall (older brother of the film's director Penny Marshall) has a cameo as "Walter Harvey", Wrigley's fictional alter ego. The sign behind the scoreboard was temporarily redone to read "Harvey Field", and filming was split between Wrigley and Cantigny Park near Wheaton, Illinois. Many television series have made featured scenes set in Wrigley Field, including ER, Crime Story, Chicago Hope, Prison Break, Perfect Strangers, My Boys, and Mike & Molly. Also, the animated comedy Family Guy featured a scene at Wrigley Field that parodied the Steve Bartman incident. In an episode of The Simpsons titled "He Loves to Fly and He D'ohs", upon arriving in Chicago, Homer walks past a number of famous Chicago landmarks, including Wrigley Field, followed by a generic-looking stadium bearing the name "Wherever the White Sox play". In 2007, the band Nine Inch Nails created a promotional audio skit, which involved Wrigley Field being the target of disgruntled war veteran's terrorist attack. The late-1970s comedy stage play Bleacher Bums was set in the right field bleachers at Wrigley. The video of the play was also set on a stage, with bleachers suggesting Wrigley's layout, rather than in the actual ballpark's bleachers. The tradition of throwing opposition home run balls back was explained by Dennis Franz's character: "If someone hands you some garbage, you have to throw it back at them!" A dog park in the Wrightwood Neighbors section of Lincoln Park is named Wiggly Field (1997). The stadium was also featured on the popular Travel Channel television show Great Hotels, starring Samantha Brown. She attended a game during a visit to Chicago. Chicago folk singer Steve Goodman featured Wrigley Field as the setting for his popular Cubs lament "A Dying Cub Fan's Last Request", extolling both the trials of the Cubs and the place Wrigley Field holds in Cub fans' hearts. After his untimely death from leukemia, Goodman's ashes were in fact scattered at Wrigley Field as described in the lyrics. The Statler Brothers' 1981 song "Don't Wait On Me" referred to a then-implausible situation: "When the lights go on at Wrigley Field". However, after lights were installed, the line was changed to "When they put a dome on Wrigley Field" for their 1989 Live-Sold Out album. A few brief shots of Wrigley Field appear in the 1949 movie It Happens Every Spring. 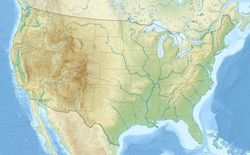 It is also seen on the History Channel's show Life After People. The stadium made a brief appearance in the open for the first episode of The Tonight Show with Conan O'Brien, with Conan rushing through the turnstiles while running from New York (where his previous show, Late Night with Conan O'Brien, was taped) to Los Angeles (where his new show was taped, until his role as host ended on January 22, 2010) and then running onto the field while being chased by Cubs security. The route O'Brien takes is somewhat misleading, as he is shown running south on Michigan Avenue past the Tribune Tower before arriving at Wrigley Field, which is well north of the Tribune Tower. In the movie Category 6: Day of Destruction, a terrorist turns off all the electricity at the stadium for a few minutes to demonstrate how hackers could penetrate city electrical systems. In episode 9 of season 3 of The Man in the High Castle (2015), Wrigley Field makes a short appearance as the home of a fictional soccer team called the Chicago Norsemen who, according to a banner, were "1963 Annual Soccer Champions". On the Sonic Youth live album Smart Bar Chicago 85 the band introduce the final song, 'Making The Nature Scene', as being about 'Tripping on Acid at Wrigley Field'. 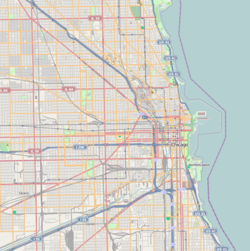 There is a sociologist and demographer called Elizabeth Wrigley-Field who is currently teaching at Columbia University, N.Y. She has her name from her parents (her mother was a Wrigley, her father a Field) but they called her simply Field, so she had to take legal steps to change her name to Wrigley-Field. A panoramic view of Wrigley Field from the upper deck prior to 2015 outfield bleacher expansion. 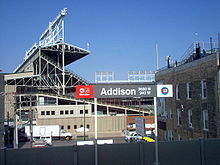 Addison Station at Wrigley Field is served by Red Line trains. This view is now blocked by buildings constructed in 2007. The Red Line stop at Addison is less than one block east of Wrigley Field. (The stadium was originally built for proximity to the train tracks.) At the conclusion of games, the scoreboard operator raises to the top of the center field scoreboard either a white flag with a blue "W" to signify a Cubs victory or a blue flag with a white "L" for a loss. This is done to show the outcome of the game to passengers on passing "L" trains, and also to anyone passing by the park. The basic flag color was once the exact opposite of the colors used today (the rationale being that white is the traditional color for surrender). In addition to rail service, the CTA provides several bus routes which service Wrigley. CTA bus routes #22 Clark, #152 Addison and #154 Wrigley Field Express all provide access to the ballpark. Pace also operates the #282 Schaumburg-Wrigley Field Express from Woodfield Mall in Schaumburg and the #779 Yorktown-Wrigley Field Express from Yorktown Shopping Center in Lombard. Biking to the field is also a popular alternative. As Halsted, Addison, and Clark streets all have designated biking lanes, getting to the field via bicycle is a widely used way to avoid hectic pre- and postgame traffic; Wrigley Field offers a complimentary bike check program to accommodate for them. Cyclists may check their bikes up to 2 hours before games at the bike racks off of Waveland Ave, and may pick up their bikes up to one hour after games end. Parking in the area remains scarce, but that does not seem to bother fans who want to come to this baseball mecca, which has drawn more than 3 million fans every year from 2004 until 2011 averaging to a near-sellout every day of the season, even with many weekday afternoon games. The little parking that is available around the park can go for as much as $100 per space. To partially alleviate this problem, the Cubs sponsor a parking shuttle service from the nearby DeVry University campus at Belmont and Western as part of their agreement with local neighborhood groups. This was not available during the last World Series prior to 2016, in 1945 against the Detroit Tigers, so cars parked as much as a mile away on residential streets and fans walked to Wrigley Field. In 2001, a series of commemorative postage stamps on the subject of baseball parks was issued by the U.S. Postal Service. Most of them were engravings taken from old colorized postcards, including the illustration of Wrigley Field. In the case of Wrigley, the famous scoreboard was sliced off, presumably to hide the original postcard's banner containing the park's name. It may also be observed that the original black-and-white aerial photo, presumably from the 1945 World Series, was taken from nearly the identical spot as the photo of the 1935 Series, allowing a comparison before and after the 1937 alterations to the bleachers. The stamp and its sources also provide a rare look at the center field bleachers filled with spectators, a practice which was later discontinued due to the risk to batters, who might lose the flight of a pitch amidst the white shirts. This led to the development of darker backgrounds to the pitchers mounds. 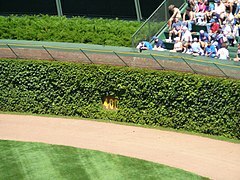 ^ Wrigley is now the only professional ballpark with an ivy covered outfield wall. Several now-demolished ballparks featured ivy in the playing area, including Forbes Field, Wrigley Field's namesake in Los Angeles, and Bush Stadium (formerly Perry Stadium) in Indianapolis. Omaha's Rosenblatt Stadium, the former home of the College World Series as well as minor league baseball, had an ivy-covered brick wall that was replaced with a padded wall. 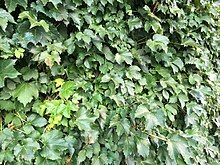 Some ballparks feature ivy on out-of-play walls, especially as a covering for the batter's eye behind the center field fence. ^ a b The score data is representative of the both shows at Wrigley Field on 16 July and 21 July respectively. ^ a b c "Cubs 3, Cardinals 2". The Boston Globe. June 2, 2017. Retrieved October 14, 2017. ^ Yellon, Al (December 8, 2013). "A Day In Wrigley Field History: May 18, 1947". Vox Media, Inc. Retrieved October 21, 2016. ^ Focus; Wrigley Field: the Unauthorized Biography, Interview with Stuart Shea, March 9, 2005, WILL Illinois Public Media, American Archive of Public Broadcasting (WGBH and the Library of Congress), Boston, MA and Washington, D.C., accessed October 3, 2016. ^ Hageman, William (March 30, 2014). "Seminary gave way to Cub faithful". Chicago Tribune. A. p. 14. ^ "Wrigley Field Information – History". Major League Baseball Advanced Media. June 12, 2015. Retrieved June 12, 2015. ^ a b Riess, Steven A. (1999). Touching Base: Professional Baseball and American Culture in the Progressive Era (revised ed.). ^ Solomon, Burt (1997). The Baseball Timeline: The Day-By-Day History of Baseball from Valley Forge to the Present Day. p. 285. ^ Strauss, Ben (January 20, 2013). "Cubs Hint at Paying for Renovations". The New York Times. Retrieved January 23, 2013. ^ Sullivan, Paul (January 20, 2013). "Selling of Wrigley Field Renovation Plan Begins". Chicago Tribune. Retrieved January 23, 2013. ^ Dardick, Hal (July 12, 2013). "New Wrigley Field Signs Clear Key Hurdle". Chicago Tribune. Retrieved August 1, 2013. ^ Dardick, Hal (July 19, 2013). "Plan Commission Endorses Wrigley Field Rehab Plan". Chicago Tribune. Retrieved August 1, 2013. ^ Wisniewski, Mary (July 24, 2013). "Chicago Approves $500 Million Revamp of Wrigley Field". Chicago Tribune. Reuters. Retrieved August 1, 2013. ^ a b Rovell, Darren (May 22, 2014). "Ricketts: Wrigley Revamp Back on Line". ESPN Chicago. Retrieved May 23, 2014. ^ Goldsborough, Bob; Hopkins, Jared (April 8, 2016). "Ricketts Family Buys Another Wrigley Field Rooftop". Chicago Tribune. Retrieved June 15, 2017. ^ "Cubs Host 1060 Project Groundbreaking Ceremony at Wrigley Field" (Press release). Major League Baseball Advanced Media. October 11, 2014. Retrieved November 10, 2014. ^ Ecker, Danny (October 2, 2014). "Wrigley Renovation Begins as Cubs Hope for Mild Winter, City Cooperation". Crain's Chicago Business. Retrieved October 2, 2014. ^ "Wrigley Field Restoration Update: Phase Two of The 1060 Project". Chicago Cubs Online. October 31, 2015. Retrieved November 2, 2015. ^ Kamin, Blair (April 8, 2016). "Wrigley Field Remake: Now It's Beautiful Outside, Too". Chicago Tribune. Retrieved October 17, 2016. ^ "Construction Timeline". Major League Baseball Advanced Media. Retrieved November 16, 2016. ^ Ecker, Danny (September 13, 2016). "Wrigley Field Hotel to Be Named for Ballpark's Architect". Crain's Chicago Business. Retrieved November 16, 2016. ^ Neveau, James (March 2, 2018). "Wrigley Renovations on Schedule, Cubs Say". NBC Chicago. Retrieved March 6, 2018. ^ Koziarz, Jay (October 13, 2017). "Wrigley Field Cleared to Begin Work on Next Phase of Club Level Renovations". Curbed. Retrieved October 28, 2017. ^ Noel, Josh (February 1, 2018). "First Look: Hotel Zachary Guest Rooms Give Subtle Hat Tip to Wrigley". Chicago Tribune. Retrieved March 6, 2018. ^ Snyder, Matt (May 26, 2015). "Harper Gets Mad at Eventual HR, Bryant 1st to Hit Wrigley Videoboard". CBS Sports. Retrieved October 17, 2016. ^ Bertha, Mike (October 14, 2015). "Cubs Will Preserve Kyle Schwarber's Mammoth HR That Landed on Top of the Wrigley Field Scoreboard". Major League Baseball Advanced Media. Retrieved August 27, 2017. ^ Bernstein, Dan (January 18, 2012). "Are Cubs Fans Growing Up?". WBBM-TV. Chicago. Retrieved January 19, 2012. ^ "Bleacher Bums (Part 1, 1984)". The Museum of Classic Chicago Television. 1984. Retrieved October 3, 2016. ^ "Ivy Thief Apprehended at Wrigley Field". Chicago Tribune. January 3, 2012. Retrieved January 3, 2012. ^ Rovell, Darren (June 13, 2017). "Cubs Selling 2,016 Leaves from Wrigley Field Ivy at $200 Apiece". ESPN. Retrieved May 23, 2018. ^ On, Esteban (April 7, 2013). "MLB Ballpark Rankings: The Best Places to Catch a Game in 2013". Total Pro Sports. Retrieved May 23, 2014. ^ a b Hunsinger–Benbow, Dana (October 27, 2016). "Ivy at Wrigley Field? It Was Snatched from Indy". The Indianapolis Star. Retrieved February 27, 2017. ^ "What Kind of Ivy Grows at Wrigley Field?". ChicagoNow. July 19, 2009. Retrieved May 23, 2014. ^ a b Cross, B. Duane (September 14, 2003). "The Runaround: Sticking With Ground Game Pays off in Week 2". Sports Illustrated. Retrieved August 6, 2008. According to Elias Sports Bureau via Michael Eisen of the G-Men, the Dolphins-Jets game was the 366th NFL regular season game played in Giants Stadium, surpassing Wrigley Field in Chicago as the most frequently used stadium in NFL history (regular season only). ^ Sachdev, Ameet (April 18, 2013). "Wrigley Field Owners Pursue Federal Landmark Status for Tax Breaks". Chicago Tribune. Retrieved February 27, 2017. ^ Banes, T. J. (December 1, 2013). "Lofts Give New Life to Historic Bush Stadium". The Indianapolis Star. Retrieved October 17, 2016. ^ Neyer, Rob (May 3, 2004). "Ballpark Quirks at Their Best". ESPN. Retrieved February 27, 2017. ^ Sullivan, Paul (October 21, 2015). "Wrigley Field Ivy Has an Appetite for Baseballs". Chicago Tribune. Retrieved February 27, 2017. ^ a b "Wrigley Field Dimensions". Baseball Field Dimensions. Archived from the original on March 7, 2010. Retrieved May 23, 2014. ^ a b c Yerak, Becky (October 27, 2016). "Wrigley Rooftops' Quirky Past Preceded Big Business, Sour Relationship with Cubs". Chicago Tribune. Retrieved May 16, 2017. ^ Sachdev, Ameet (May 20, 2010). "Cubs Owners Invest in Neighbor". Chicago Tribune. Retrieved May 21, 2010. ^ Meisner, Jason (July 22, 2016). "Former Wrigley Rooftop Club Owner Convicted of Hiding Revenue". Chicago Tribune. Retrieved April 25, 2017. ^ Meisner, Jason (January 9, 2017). "Ex-Wrigley Rooftop Owner Given 18 Months in Prison for Cheating Cubs". Chicago Tribune. Retrieved April 25, 2017. ^ Ecker, Danny (April 10, 2016). "Ricketts Family buys 10th Wrigley Field Rooftop". Crain's Chicago Business. Retrieved December 21, 2016. ^ "2011 Chicago Cubs Media Guide" (PDF). Major League Baseball Advanced Media. 2011. Retrieved April 6, 2015. ^ "2012 Chicago Cubs Media Guide" (PDF). Major League Baseball Advanced Media. 2012. Archived from the original (PDF) on April 2, 2015. Retrieved March 30, 2012. ^ Carr, Jason (March 1, 2013). "2013 Chicago Cubs Media Guide". Major League Baseball Advanced Media. Retrieved March 7, 2013. ^ "2014 Chicago Cubs Media Guide" (PDF). Major League Baseball Advanced Media. February 22, 2014. p. 6. Retrieved March 26, 2015. ^ Shea, Bill (June 8, 2015). "Tigers vs. Cubs, Tigers vs. Indians: A By-the-Numbers Financial Comparison of Opponents This Week". Crain's Detroit Business. Retrieved April 11, 2016. ^ Miles, Bruce (April 11, 2016). "Are Cubs Hot Enough to Draw 3 Million Fans This Year?". Daily Herald. Retrieved April 11, 2016. ^ Haugh, David (October 12, 2015). "Winds of Change Blow Through Wrigley as Cubs Pound Cardinals in Game 3". Chicago Tribune. Retrieved May 23, 2018. ^ Sullivan, Paul; Kane, Colleen (October 13, 2015). "Kyle Schwarber Video Board Shot Secures Place in Cubs Lore". Chicago Tribune. Retrieved May 23, 2018. ^ Gonzales, Mark (October 9, 2017). "Cubs Overcome Flaws for 2-1 Victory Over Nationals and 2-1 NLDS Lead". Chicago Tribune. Retrieved May 23, 2018. ^ "Highlight Homers". Hittracker Online. Retrieved May 23, 2014. ^ Beckmann, Jeffrey (October 14, 2011). "30 Incredibly Clutch MLB Playoff Moments No One Will Ever Care About". Bleacher Report. Retrieved October 15, 2011. ^ a b "Wrigley Field". Ballparks.com. Retrieved March 27, 2011. ^ a b c Hoekstra, Dave (March 31, 2012). "75th Season Launches for Wrigley's Iconic Scoreboard". Chicago Sun-Times. Retrieved April 1, 2012. ^ Bamford, Tab (March 15, 2011). "Wrigley Field Getting a Jumbotron?". Bleacher Report. Retrieved March 27, 2011. ^ Sullivan, Paul (March 6, 2010). "Cubs Players Like Idea of Jumbotron — Somehow". Chicago Tribune. Retrieved March 6, 2010. ^ Chumley, Cheryl K. (March 21, 2013). "Chicago Politico Proposes Tearing Down Wrigley Field Scoreboard". The Washington Times. Retrieved March 21, 2013. ^ "A Compendium of Events Since the last Cubs World Series Victory". Just One Bad Century. Retrieved May 23, 2014. ^ Cruth, Cash (April 7, 2014). "Marquee at Wrigley Field a Beloved Relic". Major League Baseball Advanced Media. Retrieved November 13, 2016. ^ Fielding, Lisa (November 2, 2015). "Iconic Wrigley Field Marquee Removed For Renovation Work". CBS Chicago. Retrieved November 1, 2016. ^ a b Ecker, Danny (August 21, 2015). "Toyota Logo to Adorn Wrigley Field Marquee". Crain's Chicago Business. Retrieved October 14, 2015. ^ Finnell, Neil (February 5, 2016). "Wrigley Field Restoration Update: Landmarks Commission Approves Marquee Renovation". Chicago Cubs Online. Retrieved November 1, 2016. ^ Bannon, Tim (April 7, 2016). "Historic Marquee Returns to Wrigley Field -- in Red and Green". Chicago Tribune. Retrieved November 1, 2016. ^ a b c Vettel, Phil (August 8, 1988). "The Cubs Get Lights at Wrigley Field". Chicago Tribune. Retrieved September 19, 2011. ^ "Cubs Remember 'Opening Night'". Major League Baseball Advanced Media. August 6, 2008. Retrieved August 6, 2008. ^ Coppock, Chet (October 4, 2013). "1963 Season: Bears Defeat Colts 10-3 at Wrigley". Chicago Bears. Archived from the original on October 5, 2013. Retrieved October 4, 2013. ^ Muskat, Carrie (April 22, 2010). "Football Returning to Wrigley Field". Major League Baseball Advanced Media. Retrieved April 22, 2010. ^ Rittenberg, Adam (November 19, 2010). "Wildcats, Illini to Use One End Zone at Wrigley". ESPN. Retrieved November 10, 2010. ^ Powers, Scott; Rittenberg, Adam (November 20, 2010). "One End Zone on Offense at Wrigley". ESPN. Retrieved March 26, 2015. ^ Tierney, Mike (August 22, 1979). "Luck Writes Rowdies' Playoff Script". St. Petersburg Times. Retrieved April 17, 2009. ^ Shea, Stuart; Castle, George (2006). Wrigley Field: The Unauthorized Biography. Potomac Books, Inc. p. 248. ISBN 1-57488-941-9. ^ McCarthy, Jack (July 22, 2012). "AS Roma Routs Zagłębie Lubin in Friendly at Wrigley". Chicago Tribune. Retrieved July 22, 2012. ^ Morrissey, Rick (January 2, 2009). "Winter Classic a Perfect Day". Chicago Tribune. Retrieved March 26, 2015. ^ "Wrigley digs deeper into the big concert biz". Chicago Tribune. Retrieved August 27, 2017. ^ Kot, Greg (April 1, 2014). "Shows that shook Wrigley all night long". Chicago Tribune. Retrieved July 12, 2014. ^ "Grand Slam Weekend". July 14, 2009. ^ "Pearl Jam Wrigley Tickets Sell Out In Record Time". NBC Chicago. February 11, 2013. Retrieved July 24, 2013. ^ "Lightning Prompts Suspension of Pearl Jam Concert". NBC Chicago. July 20, 2013. Retrieved July 20, 2013. ^ "'Night Train To Georgia' Live Concert Dvd Pre-Order Now » News". Jason Aldean. Retrieved November 14, 2013. ^ "Foo Fighters like to share at Wrigley Field". Chicago Tribune. August 29, 2015. ^ "Pearl Jam Returns to Wrigley Field: The 10 Best Moments". Consequence of Sound. August 21, 2016. Retrieved August 21, 2016. ^ Gendron, Bob (August 21, 2016). "Review: Pearl Jam at Wrigley a Triumphant Marathon". Retrieved August 21, 2016. ^ Sullivan, Paul (August 23, 2016). "Eddie Vedder Salutes Cubs Fans at Wrigley Field". Chicago Tribune. Retrieved August 23, 2016. ^ Kaplan, Ilana (August 23, 2016). "Dennis Rodman Lifted Eddie Vedder Into the Air at a Pearl Jam Show". Spin. Retrieved August 23, 2016. ^ Hyman, Dan (August 25, 2017). "Green Day Turned Back Time in Raucous Wrigley Set". Chicago Tribune. Retrieved August 26, 2017. ^ Young, Alex (February 5, 2017). "Lady Gaga Makes History as the First Female Performer to Headline Wrigley Field". Consequence of Sound. Retrieved August 27, 2017. ^ Fragassi, Selena (August 26, 2017). "Lady Gaga reigns supreme in Wrigley Field headlining debut". Chicago Sun-Times. Retrieved September 11, 2017. ^ "Cubs, Chicago Board Options Exchange Offer Auction of Cubs Season Tickets" (Press release). Major League Baseball Advanced Media. March 3, 2009. Retrieved March 26, 2015. ^ Vettel, Phil (April 7, 2009). "Captain Morgan Club to Make Wrigley Field Debut on Opening Day". Chicago Tribune. Retrieved April 8, 2009. ^ "Cubs Sale to Ricketts Is Complete". Chicago Breaking Sports. October 27, 2009. Retrieved March 27, 2011. ^ Rogers, Phil (January 31, 2013). "Hayward leaving Cubs for joint venture with Ricketts family". Chicago Tribune. Retrieved July 19, 2015. ^ "Performance Brand Elevates Partnership to Become Legacy Partner of Cubs Organization" (Press release). Major League Baseball Advanced Media. February 26, 2014. Retrieved July 19, 2015. ^ Ecker, Danny (October 10, 2014). "Cubs Add 4th Top-Tier Sponsor in ATI Physical Therapy". Crain's Chicago Business. Retrieved July 19, 2015. ^ "Wintrust Financial Corp. Signs Long-Term Deal With Cubs To Become Team's Official Bank". SportsBusiness Daily. Street & Smith's. December 4, 2014. Retrieved July 19, 2015. ^ Finnell, Neil (January 8, 2015). "Cubs and Sloan Valve Company Announce Partnership, Includes Naming Rights of Cubs Spring Training Facility". Chicago Cubs Online. Retrieved July 19, 2015. ^ McCAlvy, Adam (February 5, 2015). "Cubs Lock Up Long-Term Legacy Partnership". Major League Baseball Advanced Media. Retrieved July 19, 2015. ^ Ecker, Danny (April 2, 2015). "Nuveen Investments betting heavy on the Cubs". Crain's Chicago Business. Retrieved July 19, 2015. ^ Lazare, Lewis (August 21, 2015). "Chicago Cubs and Toyota Really Sweeten Their Marketing Partnership". Chicago Business Journal. Retrieved August 22, 2015. ^ Belson, Ken (November 10, 2015). "Pepsi Is Departing Citi Field, Leaving Behind a Bare Porch". The New York Times. Retrieved November 11, 2015. ^ Honan, Katie (November 10, 2015). "Pepsi Ditches Mets for Cubs". DNAinfo. Archived from the original on November 12, 2015. Retrieved November 11, 2015. ^ "Wrigley Field". ESPN. Retrieved May 23, 2014. ^ Sullivan, Paul (November 6, 2016). "Writing on the Wrigley Wall: Latest Way to Celebrate Cubs' World Series Title". Chicago Tribune. Retrieved May 17, 2017. ^ Wright, Roger (November 2, 2016). "Writing On Wrigley Field's Walls". The Huffington Post. Retrieved May 17, 2017. ^ Kurtenbach, Dieter (November 3, 2016). "Cubs Fans Write Heartwarming Messages on Wrigley Field's Brick Walls". Fox Sports. Retrieved May 17, 2017. ^ "Cubs Fans Write Their Names in Chalk on Brick Wall of Wrigley Field". The Boston Globe. Associated Press. November 3, 2016. Retrieved May 17, 2017. ^ "Year Zero Research/Proven Leads". NinWiki. Retrieved March 27, 2011. ^ Hurst, Jack (August 31, 1989). "A Chicago First – Statlers Revise a Hit Tune to Reflect Wrigley Field Reality". Chicago Tribune. p. 14. Retrieved March 26, 2015. ^ "See Her". University of Wisconsin. Retrieved February 23, 2015. ^ Berg, Ted (January 7, 2010). "Baseball Blog". TedQuarters. Retrieved February 23, 2015. ^ "Bike Program". Major League Baseball. Retrieved May 23, 2014. Wikimedia Commons has media related to Wrigley Field.